More seriously, though, I agree with BadKen and Redwing. I think the AC franchise may have left behind. And they had a golden opportunity to reverse the gender gap, with a 75% Evie and 25% Jacob ratio. But I guess the flops that were AC: China and AC: Liberation is enough to justify that people don't want to play as female characters (not to mention that they're just so hard to animate... *sigh*). Never mind that these games were pretty different from the main franchise. AC: China doesn't even have the same gameplay from the videos I've seen. Ugh, sorry, I'm rambling, but I'm just very underwhelmed. You're not rambling It's all completely valid. The game play (I know, it's Alpha) looks bland, the NPC animations look like they are from last gen, and they sped up the fight animation in a way that it looks too comic-booky. As for playing as a female character, I WANT to play as one, Ubisoft just needs to bring their "A" game and give us a fantastic game with a strong female lead. I can't imagine wanting to pre-order something when you have no clue what Ubisoft you're getting with this installment. The one that brought you Assassin's Creed 2 & Brotherhood or the one that brought you III & Unity. As for AC: China, I don't think I'd consider that a flop and even if it was, I don't believe it's because of the gender of the character. I've played it a bit as I got it for free with the season pass. It's OK, but I have other games that are more interesting. It's pretty much Mark of the Ninja but with Assassin's Creed. I watched the trailer for AC: Syndicate and I honestly can't say anything really made me interested. I'm still curious about this though as a longstanding fan of the series, but I think I'll have to jump out of the thread otherwise I'm just going to bring negativity. Something I don't particularly want to do if people are genuinely looking forward to this. Will we get to climb things to make other things appear on the map? That never gets old. I'd like to see them work on their world simulation a bit more. As the years roll on these gang hide-outs with prisoners sitting there while someone points a gun at them forever is weird. The world feels too much like it's holding its breath waiting for you to show up. Say what you will about GTA V, it moves. Things are happening and it feels like whether you're there or not it will work fine. Tough design challenge but that gameplay demo was a copy-paste of sh*t I was doing in Rogue a few weeks ago. New ways to traverse doesn't fix the fundamental groundwork of the game systems they've been flogging for years now. See, but that is only if you are interested in changes to the system. For my part, I want no change - I am totally happy with the same game every year with slight gameplay updates, but no overall change to the game. I really don't want a new iteration of AC - I want and am totally happy with AC brotherhood's gameplay with prettier graphics every 12 months(in fairness, the addition of sailing was really cool). I thought that was why Rogue was so good - because it was so basic and really all it was about was climbing high things and stabbing guys. I have games like GTA V to have living breathing words - I just want to stab people and climb towers in AC games. I personally like the lackluster AI that seems to be just standing around waiting for me to stab them. Wait... he has a cannon on his forearm? What the hell! I want to see the sources Ubisoft is using for the costumes. They've been really good at that kind of stuff in the past games, I'd love to see what how they got to that. I mean, at this point, who knows. They might just be German, and we all know how much the Germans love that leather. The knife the main character has is a khukuri used by the Gurkhas. They fight with the British army today but the relationship apparently goes back to 1814. While I completely understand what you are saying, and am guilt of more or less the same thought when it comes to Resident Evil (The older ones not 5 on), I think that developers need to be always poking and prodding their games with innovation. That's how you end up with really cool mechanics like the sailing you mentioned. Had someone at Ubisoft not said to themselves "Hey, what can we do to make this game stand out over the others" we wouldn't have Black Flag. Also, climbing giant buildings and stabbing AI that has the personality and intelligence of a door-nob will only take a series so far until people get tired of the same-ol and eventually stop purchasing further iterations all together. That of course, will then lead to a series going completely away. This industry NEEDS new ideas, new mechanics and interesting characters to keep gaming relavent. See also: Far Cry 4 and the lost letters side missions. The Pre-Order Packs have been announced. I've lost count -- is this Ubisoft Map-Defragging Simulator XI or XII? After Unity I think I'll be passing on this one, but will be checking back in this thread for impressions. I'm liking the edition with the pork pie. More collectors editions should have pork pies in them. Some gameplay. Looks like every other AC game. Remember how fun the carriage parts of AC2 were? Yeah... now you can do those any time you want, if you're a horrible horrible person who actually enjoyed those portions. Also, I'm bothered by what's happening at about 7:00 minutes. The animations in the first cinematic of that footage was pretty fantastic though. Maverick, I'm not going to say you're not allowed to feel "bothered" by what's happening in the video, but I kind of think it's a step in the right direction. It's equal consequence for equal stakes. Isn't that the goal? I don't... I don't know what that means, but that dude just cold cocked some random person and stole their ride. That just ain't right. Watched the video. That's... not how horses work. It's also not how humans work, but people have been ok with the climbing since AC1. Loomer has interviewed the game's director. He seems smart and thoughtful, if not altogether forthcoming. I don't think this mission has been widely shown. I hadn't seen it before finding it on Youtube. Great train station and a delightfully English voice over. At last, someone who's voice I can clearly understand :P.
Looks interesting, but after Unity I'm pretty much done buying these games on day one. Yup. Very excited to play this, but I have had enough bad Ubi launches that I am not buying day one. Reviews are generally positive all around getting mostly 8's and some 9's. High points seem to be the charming and fun interaction between protagonists, fun combat, and better traversal. It's being called the best after Black Flag. For the first time in a main release in the series since 2010's Assassin's Creed: Brotherhood, Syndicate features no multiplayer at all — neither the unique spin on competitive multiplayer nor the cooperative play that was added in Unity. 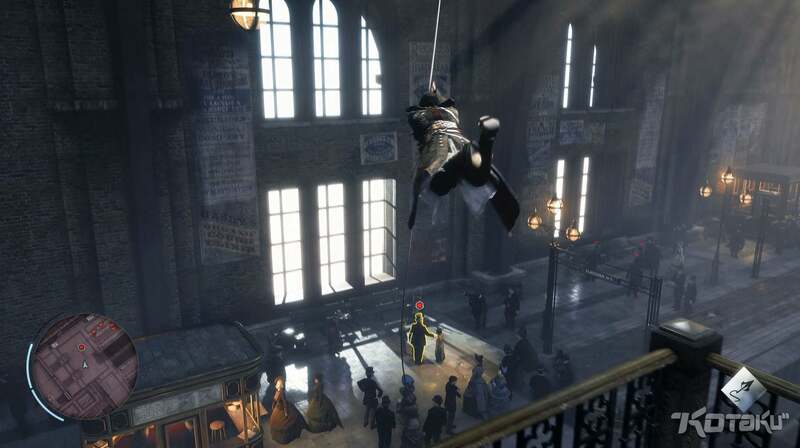 While some might miss the company of other assassins, it seems clear that the game has benefited from a focus on developing and polishing the single-player experience. In addition to a higher quality of design, Syndicate suffers much less from the bugs and glitches that plagued last year's Assassin's Creed. I ran into a couple of crashes and enemies spawning into weird places. In one case, I fell through the world. But there was nothing on the level of the nonstop problems that Unity had. Also absent from Syndicate: the dozens of chests and bonus features that could only be unlocked via a second-screen app or joining the Assassin's Creed Initiates group. The game now features a single option in the menu to log in to a "Ubisoft Club" account and unlock a few extras, but it never pushes it on the player. 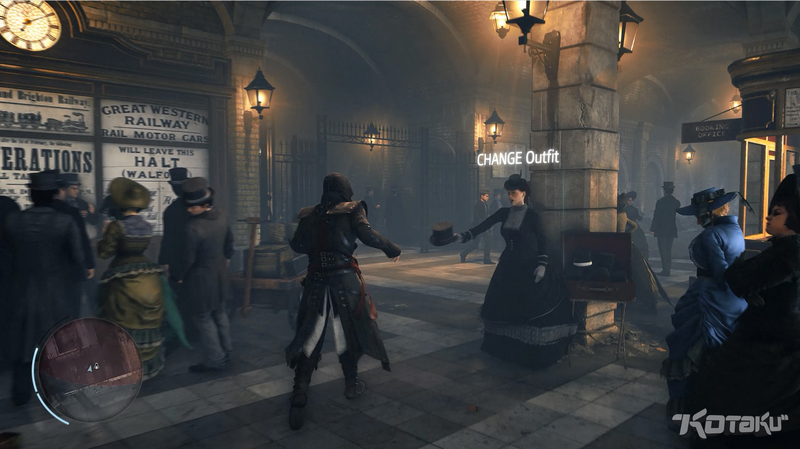 And despite still having the ability to purchase in-game currency with real money, Syndicate never feels miserly. I finished the game with 80 percent completion in around 30 hours, and managed to hit max level, purchase all gang upgrades and do most of the crafting I wanted without ever even considering buying extra material with real money. It's also notable that despite having an already announced paid downloadable add-on, Syndicate has plenty of meat on its bones. There's one particularly cool and lengthy segment I won't spoil that absolutely struck me as the kind of thing that Ubisoft would normally have tried to section out and sell as DLC. Hopefully this marks the beginning of a more outwardly consumer-friendly attitude for the series. Assuming it ships today *refreshes Amazon page again* I should be playing it tomorrow and can put some initial impressions out there. Told myself I wasn't going to Day 1 this after last year, but suddenly hit a major slump in multiple games at once and wanted something new to do. I look forward to playing this on the one-year delay I seem to play all Assassin's Creed games on! In other news, I'll probably be getting Unity on the next sale!